If you like lasagna you will love this easy casserole. Baked ziti is a classic Italian dish and my version is light and healthy, made with lean ground sirloin and part skim cheeses. If you’re tempted to buy pre-shredded mozarella for this dish you may be disappointed. Any cheese that is pre-shredded will never melt as well as real cheese that you shred by hand. That’s due to the stabilizers that are added to packaged shredded cheeses. It takes about a minute to shred your own cheese so just do it. You’ll be rewarded with a creamy, melty dish that’s as close to lasagna as I’ve ever had. 18 Comments on "Easy Baked Ziti"
I had trouble preparing pork chops until I discovered the ‘reverse sear” method for cooking them. They are evenly cooked and not dry! A bone-in loin chop is recommended for best flavor. An instant read thermometer is essential to prevent over cooking. 165 degrees is recommended by the USDA. Visit seriouseats.com for instructions. I’m having an awful time trying to print your recipes. All I want is the recipe. l have the same problem whats the solution? If the “Print” button at the top right does not work, please see the FAQs. This Baked Ziti is my go-to. I love this recipe. I use more onion and garlic in the sauce, and sometimes I use Italian sausage along with grass fed beef. I use a whole lb. of mozzarella cheese. Can’t thank you enough for your wonderful recipes. Where are your videos on YouTube? Where are you on Pinterest? I miss you, and I’m wishing you well. There are links for my videos, pinterest, instagram, facebook, and youtube on this website. On a desktop they are along the right; on mobile, they are at the bottom. hi. my mum’s going to make zitty, and love your videos. and your site is well laid out, for blind computer users who use a screen reader like i use jaws for windows from http://www.freedomscientific.com. and able to navigate the headings, find items via the search, or listen to some of your videos using winamp on m windows 10 toshiba laptop. keep up the good work. some sites i have visited, not very blind friendly. one of the better sites. marvin from australia. Hi Marvin. That’s good to hear – thanks for letting me know. Greetings back to you from California. 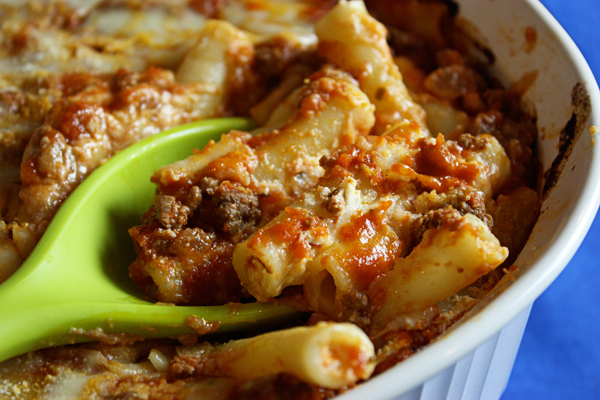 Exceptional baked ziti recipe ! I just made this tonight- it was delicious! I intentionally did not add seasonings because there are so many difference sauces available all over the country (& internationally) but it’s easy enough for anyone to adjust based on the sauce you use. I made this on Thursday, and it’s so good! The only thing I would add is – you don’t want to add saute the garlic with the onions right away. The garlic doesn’t take as long and burns easily. Add the garlic just before the onions are done, and it won’t burn. I splurged on a great marinara sauce (one of the high-end Italian restaurants sells their sauce at a local market), and it was excellent! Thanks for your great recipes! I agree Robin. I see so many recipes where they add the garlic with the onion and burnt garlic can spoil the whole dish. Adding it as you said is better and safer for most cooks. I always add it later too. For vanilla pudding I make my custard pudding that’s posted here. And I will be posting my butterscotch pudding soon. Where are you? I miss you so much on YouTube .